Cincinnati Pops Orchestra celebrates the 50th anniversary of the first manned lunar landing with a performance of “space age” favorites and a newly commissioned work. 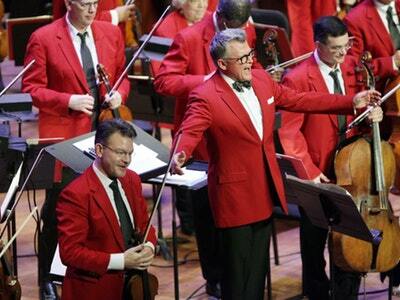 On January 18, 19, and 20 Conductor John Morris Russell will lead the Cincinnati Pops Orchestra (CSO) in Pops in Space, a concert celebrating the 50th anniversary of the first manned lunar landing and humanity’s love and fascination with all things celestial. In recognition of this anniversary, the Pops will perform several “space age” favorites, including excerpts from Gustav Holst’s The Planets and selections from The Last Jedi and The Force Awakens (from the Star Wars movie franchise) by John Williams and Star Trek by Michael Giacchino. In special honor of the lunar landing’s anniversary, the Pops will also unveil a newly commissioned piece by Mr. Giacchino in its World Premiere. Titled “Voyage,” this new work and other works in this concert will be accompanied by a series of NASA images projected onto a large screen above the orchestra by creative partner Lightborne. The concert starts at 8 pm on Friday and Saturday (Jan 18 and 19) and 2 pm on Sunday (Jan 20). Tickets start at $15 for kids and $25 for adults.